By Rev. Lawrence Dewan, O. P.
Renowned Dominican priest and Thomistic philosopher, Reverend Lawrence Dewan, O.P., delivered a lecture entitled “Being a Disciple of St. Thomas Aquinas in the Pursuit of Wisdom” as the keynote speaker at Christendom College’s annual St. Thomas Aquinas Lecture on January 28, 2011. A member of the Pontifical Academy of St. Thomas Aquinas in Rome, Dewan studied philosophy at the University of Toronto, the University of Paris, and the Pontifical Institute of Mediaeval Studies. He has taught at the University of Ottawa, Saint Mary’s University, the University of Toronto, Université Laval of Québec, and the Catholic University of America in Washington, D.C. 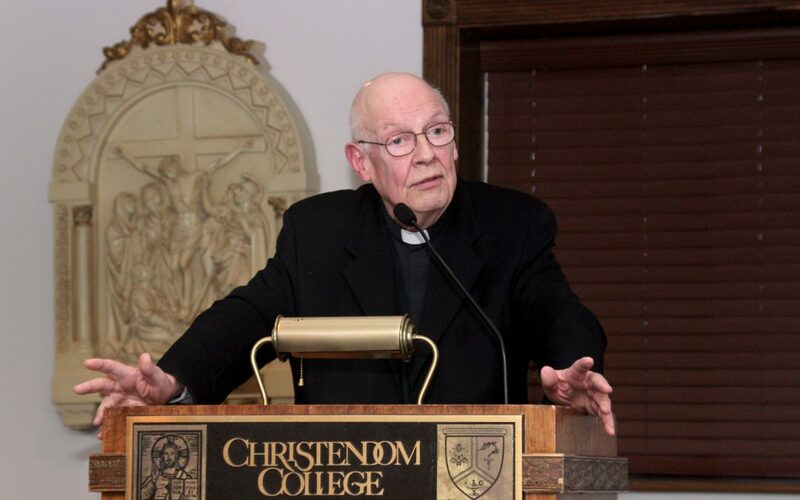 He is author of three books: Form and Being: Studies in Thomistic Metaphysics; St. Thomas and Form as Something Divine in Things; and Wisdom, Law, and Virtue: Essays in Thomistic Ethics.